Received August 6, 2018; Revised August 10, 2018; Accepted August 10, 2018. The phylogenetic relationships among species and subspecies in the genus Vigna were investigated using sequence data from the chloroplast and nuclear regions as DNA barcodes. We analysed 156 accessions of 56 species of the taxonomically best-known groups in the genus and evaluated the effectiveness of three chloroplast regions and a nuclear dataset currently employed as DNA barcodes using the barcoding gap, applied similarity, and tree-based methods. The chloroplast regions were able to identify fewer than 44% of the species, whereas the nuclear datasets identified more than 62% of the species using the “best match” and “best close match” options in the TaxonDNA software. All species had high interspecific pairwise distances that did not fully overlap with the intraspecific distances, and the tree-based analysis resolved more than 80% of the species. The nuclear ribosomal internal transcribed spacer 2 (ITS2) region was the most useful as a single barcode and the four-barcode combinations that included ITS2 provided the best discriminatory power. Therefore, we suggest that the ITS2 barcoding region should be used as a starting point to identify Vigna species. Legumes (Fabaceae) make up the third-largest flowering family comprises 770 genera and over 19,500 species, which broken up into three widely accepted sub-families: the Caesalpiniodeae, the Mimosoideae and the Papilioniodeae. The high-quality protein source from the legumes can be substituted to dietary animal protein (Anderson et al. 1999). Wide range of secondary metabolites from legumes have been utilized as nutraceuticals and various by-products have also been developed for industrial application including biofuels (Lewis et al. 2005). Moreover, legumes were playing an important role in sustainable agriculture: managing soil fertility via symbiotic nitrogen fixation and used to grown as a rotation crop with cereal and vegetable (Arianoutsou and Thanos 1996; Velazquez et al. 2010). The genus Vigna is belongs to the Fabaceae family composed of more than 200 species; it is widely distributed throughout the warm regions mainly in Africa and Asia (Smartt 1990). The genus Vigna has enormous, as-yet untapped economic potential. Thus, a reliable identification method at the species level is utmost importance. Mostly the plant species identification has been done with morphological traits. However, for the plant phenotypic characterization, a well-qualified botanical taxonomist or highly trained technicians need to be considered. Numerous molecular markers have been reported for plant species discrimination; the most used DNA markers were RFLP (Beckmann and Soller 1983), RAPD (Williams et al. 1998), AFLP (Vos et al. 1995), ISSRs (Zietkiewicz et al. 1994) and SSRs (Becker and Heun 1995). Recently, several DNA barcoding loci have been recommended to identify the plant species (Chen et al. 2010). DNA barcoding can be performed easily in any molecular biology laboratories and does not require plant morphological information. Many recent studies on DNA barcoding in plants focused on multiple loci, including nuclear (ITS) and plastid regions (psbA-trnH, rpoC1, matK and rbcL). Reports on the selection of a barcode for medicinal plants have also highlighted the ITS2 region as an effective DNA barcode (Chen et al. 2010; Gao et al. 2010). Given the significant variation information in the ITS2 region, a combination of this locus was considered efficient enough for DNA barcoding. Therefore, the objective of the present study was to investigate and compare the DNA barcodes for the discrimination of Vigna species. A total of 156 Genebank accessions belonging to 56 Vigna species and subspecies were obtained from the National Agrobiodiversity Center, Rural Development Administration (RDA), Republic of Korea (Supplementary Table S1). To determine the barcoding loci, which can be applied to resolve the Vigna species, we sampled two to three individuals per species. Leaf samples were harvested from 3-week-old seedlings, which were germinated in a greenhouse. All DNA extraction, PCR amplification with universal primers (rbcL, psbA-trnH, ITS2 and matK), and amplicon sequencing were performed according to the manufacturers’ instructions and previously published methods (Raveendar et al. 2017). Barcoding DNA sequences were submitted to NCBI GenBank (Supplementary Table S1). Consensus sequences of each barcoding regions (rbcL, psbA-trnH, ITS2 and matK) were manually edited and aligned with MEGA6 (Tamura et al. 2013). Manual adjustments were made in order to improve alignment. All variable sites in the each sequence were rechecked with the original trace files. We evaluated the effectiveness of each individual region and the effectiveness of the regions in combination as barcodes using three different approaches. SpeciesIdentifier program from the TAXONDNA software package was used to evaluate the potential of barcoding regions to accurately identify species. It compares each sequence in the dataset based on their pairwise genetic distances and determine the sequences are likely to be conspecific. Additionally, the “best match” and “best close match” functions based on barcoding gap were used to test the species discrimination rates for each and all combinations marker under the K2P-corrected distance using TAXONDNA (Meyer and Paulay 2005). Barcoding gap means to measure the effectiveness of a barcoding locus and is present when a species is distinct from its nearest neighbor (NN) if the maximum intraspecific distance is less than the distance to its NN (CBOL Plant Working Group et al. 2009; Hollingsworth et al. 2009; Krawczyk et al. 2014). To evaluate the barcoding gap, the relative distribution of pairwise genetic distances was calculated using TAXONDNA (Meier et al. 2006). Histograms were generated for the barcoding gaps to evaluate whether the interspecific distances were larger than the intraspecific distances. In a phylogenetic method, species classification was considered effective when all conspecific individuals formed a single clade. Therefore, different phylogenetic methods, such as neighbor-joining (NJ), and maximum likelihood (ML), were selected for these analyses. For efficient species discrimination, aligned barcodes (rbcL, psbA-trnH, ITS2, and matK) were assessed with bootstrap method (1000 replicates) using pairwise deletion (Felsenstein 1985). An un-rooted NJ dendrogram were constructed with K2P distances (Kimura 1980) using MEGA6 program (Tamura et al. 2013). Species identification was evaluated with bootstrap values, as described by (Liu et al. 2011). ML trees were also constructed with 1000 bootstrap (BS) replicates based on the Bayesian Information Criterion (BIC). If a sequence formed a clade with moderately supported (>50% BS) value, the query was considered successful. The sequence characteristics of the four barcoding regions assessed in this study are summarized in Table 1. Barcode sequences alignments with ClustalW were successful across all taxa. However, the aligned sequences showed considerable variations in size; the aligned length of rbcL was 585 bp, whereas it was 398 bp for psbA-trnH, 468 bp for ITS2, and greatest for matK (709 bp). A total of 624 sequences for 156 individual specimens were aligned from the 56 Vigna species. The unique sequence alignment analysis revealed that nucleotide diversity (π) was similar among the four loci, in which ITS2 exhibited higher pi values (0.13). A total 469 positions were found after eliminating the gaps and missing data from the final dataset. The relative distribution of the frequencies of K2P distances was calculated based on single barcodes, and the barcode combinations psbA-trnH + ITS2 + matK and rbcL + psbA-trnH + ITS2 + matK demonstrated no barcoding gaps with significant overlap (Fig. 1). As a single barcode, ITS2 showed the highest divergence in interspecific variation, followed by psbA-trnH, when compared with the intraspecific distances (Fig. 1). Similarly, in barcode combinations, psbA-trnH + ITS2 + matK showed the similar variation that found for the ITS2 region (Fig. 1). The results of identification tests performed with the TAXONDNA software are shown in Table 2. When comparing the results of the “Best match” and “Best close match” analyses, the highest rates of correct identification were observed for the ITS2 region (78%) and the lowest values were found for rbcL (40%) based on TAXONDNA functions. In “best match,” the identification was considered a success when both sequences were identified from the same species, whereas best matches from different species were considered as ambiguous. In “best close match,” the sequence query was considered success when the species name was identical. The efficiency of individual level identification was higher than at the species level when analysed with individual and all barcode combinations (Table 2). NJ and ML trees were used for the evaluation of species identification within the genus Vigna. The phylogenetic analysis-based NJ tree of single and concatenated sequence data generally discriminated between Vigna species (Supplementary Figs. S1–S15). If individuals or species with few samples formed a distinct clade, then the identification considered efficient at the species level. In this study, 156 accessions were placed into distant clades with high bootstrap support values. As a single barcode, ITS2 has classified most of the Vigna species, though few closely related subspecies were not classified. The ML tree constructed for the 56 species based on combinations of DNA barcodes is shown in Fig. 2. 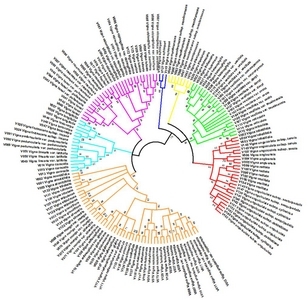 The ML tree revealed that the 156 individuals corresponding to the 56 species were classified into distinct clades with high bootstrap support values. Similar to the results of the NJ tree, the ML tree based on concatenated sequences divided the 56 Vigna species into seven groups (I–VII): group I contains V. unguiculata, V. vexillata, V. radiate, V. angivensis, and V. lobatifolia, group II included with species of V. reticulate, V. heterophylla, V. frutescens, and verieties of V. vexillata, group III was formed by species of V. friesiorum and V. membranacea, group IV was formed by V. schimperi as a distant clade, group V classified with six Vigna species and subspecies (V. hosei, V. racemose, V. fischeri, V. oblongifolia, V. marina, and V. luteola), group VI contained species and subspecies of V. Caracalla, V. linearis, V. peduncularis, V. lasiocarpa, V. longifolia, and V. frutescens and group VII contains the remaining 19 Vigna subspecies and varities (V. aconitifolia, V. trilobata, V. stipulacea, V, grandiflora, V. silvestris, V. mungo, V. reflexpilosa, V. glabrescens, V. trinervia, V. umbellate, V. riukiuensis, V. nakashimae, V. tenuicaulis, V. hirtella, V. angularis, and V. nepalensis) were clssified. DNA barcoding with large number of individuals (species/accessions) has provided insights into relationships between species, which also has the ability to precisely estimate the intraspecific heterogeneity. In the present study we have obtained the samples from RDA GeneBank records. Therefore, we believe that all of them were based on correctly identified plant species, but as we were not able to identify mistakes, we included at least two different samples from different sources in our analyses. The main criterion for a standard DNA barcode is universality, in which the DNA barcode should be easily accessible from plants with a combination of primers (CBOL Plant Working Group et al. 2009). In our study, DNA barcode sequences were found to be easily amplified using polymerase chain reaction (PCR). A total of 624 sequences from 156 accessions, which belongs to 56 Vigna species were obtained. Nucleotide diversity (π) rate were tested, in which all pairwise comparisons showed the average genetic distance ranged from 0.011 to 0.132, as shown in Table 1. Bergsten et al. (2012) reported, in large-scale barcoding, the genetic distance is linked to population size and sampling geographic scale. Hence, we incorporate more accession in the genus to identify the variance in genetic distance between populations. Among the barcodes, ITS2 resolved the greatest number of species, while the multi-gene combinations significantly improved the species resolution (Table 1). This remained true when the nuclear ITS2 region was added to the analysis. Only marginal gains in taxonomic resolution (62% vs. 70%) were achieved when ITS2 was included in a two- (rbcL + ITS2) or three-locus barcode (psbA-trnH + ITS2 + matK). Owing to its high capacity for species discrimination, ITS2 has been reported as best candidate loci for DNA barcoding in plants (Chen et al. 2010; Gao et al. 2010; Vijaykumar et al. 2010). Similarly, in the present study, the ITS2 region showed promising results on distinguishes Vigna species. NJ and ML trees were used to assess identification efficiency within the Vigna species. One of the main tasks in a gene bank is reviving accessions and proper maintenance of genetic variation. Loss of diversity and loss of identity are the two common risks factor associated with revival of accessions in Genebank (Vencovsky and Crossa 1999). Phylogenetic trees based on un-rooted NJ and ML analysis with the nucleotide sequences of the four loci were topologically similar (Fig. 2, Supplementary Fig. S15). When comparing the datasets within each species and subspecies with a tree-based method, ITS2 showed the highest discriminatory power (Table 1), with 73% of all species properly identified, followed by matK (55%), psbA-trnH (46%), and rbcL (27%). However, phylogenetic trees based on concatenated sequences of the four loci improved the tree topology and species discrimination has also increased to 95% (Table 1, Fig. 2). DNA barcoding success lies in the distinctness of the clusters (Steinke et al. 2009). If individuals within a species or subspecies formed a distinct clade, the identification was considered a success at the species level. The clustering relationships among the species were similar to those found by (Vijaykumar et al. 2010), who used smaller sample sizes for each species. Across all locus combinations and using a single locus, 31 of the 56 species received >90% branch support (Supplementary Figs. S1–S15), which indicates clear genetic distinction between Vigna species. The phylogenetic relationships among species in the genus Vigna were also investigated with nuclear specific ribosomal ITS and chloroplast DNA regions ( Doi et al. 2002; Javadi et al. 2011; Takahashi et al. 2016). Similarly, in the present study, the combination of nrDNA and cpDNA barcodes sequences proved efficient for discriminating between Vigna species. In conclusion, the study revealed that ITS2 loci are useful as single DNA barcodes for the genus Vigna, as reported in earlier studies ( Doi et al. 2002; Goel et al. 2002; Saini et al. 2008; Vijaykumar et al. 2010). The combination of rbcL + psbA-trnH + ITS2 + matK provided the most accurate discriminatory power (100% species ID) and was the most efficient barcoding tool to identify Vigna species. The K2P-corrected pairwise distance and the dendrogram clearly revealed considerable sequence variation that could easily differentiate between all Vigna species. 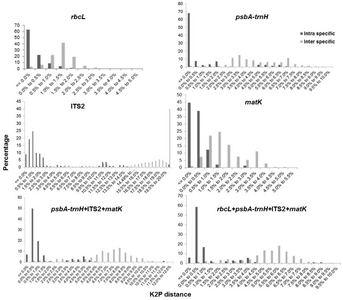 The sequence data obtained from the nuclear ITS2 and chloroplast rbcL, psbA-trnH, and matK regions successfully discriminated between the species studied. Thus, our results suggest that ITS2-based multi-loci barcode could be efficient enough to resolving phylogeny within the Vigna species. This study was carried out with the support of the “Research Program for Agricultural Science & Technology Development” (Project No: PJ008623) and was supported by the 2016 Postdoctoral Fellowship Program of the National Academy of Agricultural Science, Rural Development Administration, Korea. Fig. 1. Relative distribution of K2P distances across all sequence pairs of Vigna datasets for different markers. Fig. 2. Phylogenetic analysis of Vigna species based on combinations of barcode loci. The ML tree was developed using the Kimura 2-parameter method on nucleotide sequences of rbcL + psbA-trnH + ITS2 + matK region. Numbers next to the branches are the ML bootstrap support values. Genetic diversity of barcoding markers and marker combination used in this study. The number (rate) of sample identification based on analysis of the ‘Best March’ and ‘Best Close Match’ functions of TAXONDNA software for each DNA barcoding marker and their combinations in 156 individual specimens. Anderson, JW, Smith, BM, and Washnock, CS (1999). Cardiovascular and renal benefits of dry bean and soybean intake. Am J Clin Nutr. 70, 464s-474s. Arianoutsou, M, and Thanos, CA (1996). Legumes in the fire-prone Mediterranean regions: An example from Greece. Int J Wildland Fire. 6, 77-82. Becker, J, and Heun, M (1995). Barley microsatellites: allele variation and mapping. Plant Mol Biol. 27, 835-845. Beckmann, JS, and Soller, M (1983). Restriction fragment length polymorphisms in genetic improvement: methodologies, mapping and costs. Theor Appl Genet. 67, 35-43. Bergsten, J, Bilton, DT, Fujisawa, T, Elliott, M, Monaghan, MT, and Balke, M (2012). The effect of geographical scale of sampling on DNA barcoding. Syst Biol. 61, 851-869. Chen, S, Yao, H, Han, J, Liu, C, Song, J, and Shi, LC (2010). Validation of the ITS2 region as a novel DNA barcode for identifying medicinal plant species. PLoS One. 5, e8613. Hollingsworth, PM, Forrest, LL, Spouge, JL, Hajibabaei, M, Ratnasingham, S, and CBOL Plant Working Group (2009). A DNA barcode for land plants. Proc Natl Acad Sci USA. 106, 12794-12797. Doi, K, Kaga, A, Tomooka, N, and Vaughan, DA (2002). Molecular phylogeny of genus Vigna subgenus Ceratotropis based on rDNA ITS and atpB-rbcL intergenic spacer of cpDNA sequences. Genetica. 114, 129-145. Felsenstein, J (1985). Confidence limits on phylogenies: An approach using the bootstrap. Evolution. 39, 783-791. Gao, T, Yao, H, Song, J, Liu, C, Zhu, Y, and Ma, X (2010). Identification of medicinal plants in the family Fabaceae using a potential DNA barcode ITS2. J Ethnopharmacol. 130, 116-121. Goel, S, Raina, SN, and Ogihara, Y (2002). Molecular evolution and phylogenetic implications of internal transcribed spacer sequences of nuclear ribosomal DNA in the Phaseolus-Vigna complex. Mol Phylogenet Evol. 22, 1-19. Hollingsworth, ML, Andra Clark, A, Forrest, LL, Richardson, J, Pennington, RT, and Long, DG (2009). Selecting barcoding loci for plants: evaluation of seven candidate loci with species-level sampling in three divergent groups of land plants. Mol Ecol Resour. 9, 439-457. Javadi, F, Tun, YT, Kawase, M, Guan, K, and Yamaguchi, H (2011). Molecular phylogeny of the subgenus Ceratotropis (genus Vigna, Leguminosae) reveals three eco-geographical groups and Late Pliocene-Pleistocene diversification: evidence from four plastid DNA region sequences. Ann Bot. 108, 367-380. Kimura, M (1980). A simple method for estimating evolutionary rates of base substitutions through comparative studies of nucleotide sequences. J Mol Evol. 16, 111-120. Krawczyk, K, Szczecińska, M, and Sawicki, J (2014). Evaluation of 11 single-locus and seven multilocus DNA barcodes in Lamium L. (Lamiaceae). Mol Ecol Resour. 14, 272-285. Liu, J, Moller, M, Gao, LM, Zhang, DQ, and Li, DZ (2011). DNA barcoding for the discrimination of Eurasian yews (Taxus L., Taxaceae) and the discovery of cryptic species. Mol Ecol Resour. 11, 89-100. Meier, R, Shiyang, K, Vaidya, G, and Ng, PKL (2006). DNA barcoding and taxonomy in Diptera: A tale of high intraspecific variability and low identification success. Syst Biol. 55, 715-728. Meyer, CP, and Paulay, G (2005). DNA barcoding: error rates based on comprehensive sampling. PLoS Biol. 3, e422. Raveendar, S, Lee, J-R, Shim, D, Lee, G-A, Jeon, Y-A, and Cho, G-T (2017). Comparative efficacy of four candidate DNA barcode regions for identification of Vicia species. Plant Genet Resour. 15, 286-295. Saini, A, Reddy, SK, and Jawali, N (2008). Intra-individual and intra-species heterogeneity in nuclear rDNA ITS region of Vigna species from subgenus Ceratotropis. Genet Res. 90, 299-316. Smartt, J (1990). Vavilov Law of Homologous Series and de novo crop plant domestication. Biol J Linn Soc. 39, 27-38. Steinke, D, Zemlak, TS, Boutillier, JA, and Hebert, PDN (2009). DNA barcoding of Pacific Canada’s fishes. Mar Biol. 156, 2641-2647. Takahashi, Y, Somta, P, Muto, C, Iseki, K, Naito, K, and Pandiyan, M (2016). Novel genetic resources in the genus Vigna unveiled from Gene Bank Accessions. PLoS One. 11, e0147568. Velazquez, E, Silva, LR, and Alvaro, P (2010). Legumes: a healthy and ecological source of flavonoids. Curr Nutr Food Sci. 6, 109-144. Vencovsky, R, and Crossa, J (1999). Variance effective population size under mixed self and random mating with applications to genetic conservation of species. Crop Sci. 39, 1282-1294. Vijaykumar, A, Saini, A, and Jawali, N (2010). Phylogenetic analysis of subgenus Vigna species using nuclear ribosomal RNA ITS: evidence of hybridization among Vigna unguiculata subspecies. J Hered. 101, 177-188. Vos, P, Hogers, R, Bleeker, M, Reijans, M, van de Lee, T, and Hornes, M (1995). AFLP: a new technique for DNA finger-printing. Nucleic Acids Res. 23, 4407-4414. Williams, DJ, Kazianis, S, and Walter, RB (1998). Use of random amplified polymorphic DNA (RAPD) for identification of largemouth bass subspecies and their intergrades. Trans Am Fish Soc. 127, 825-832. Zietkiewicz, E, Rafalski, A, and Labuda, D (1994). Genome fingerprinting by simple sequence repeat (SSR)-anchored polymerase chain-reaction amplification. Genomics. 20, 176-183.